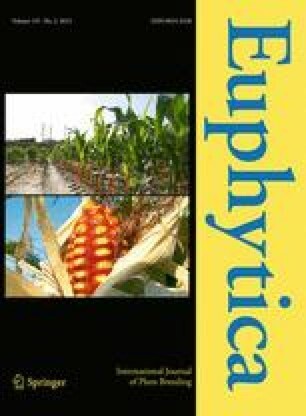 Genetic distance analysis among quality protein maize (QPM) inbred lines and the correlation of genetic distance with heterosis would help to design breeding strategy and predict hybrid performance. This study was carried out to determine the amount of genetic diversity among QPM inbred lines using SSR markers and morphological distances; to classify the inbred lines according to their relationships; and to estimate the correlations of SSR markers and morphological distances with hybrid performance, heterosis and specific combining ability (SCA). One-hundred and five hybrids generated by diallel crossing of 15 QPM inbred lines were evaluated with the 15 parents for 17 morphological traits at Harare, Zimbabwe and Bako, Ethiopia and also examined for DNA polymorphism using 40 SSR markers. SSR markers and morphological methods of genetic distance estimates showed moderately high genetic distance among the inbred lines studied. Cluster analysis based on the two distance measures grouped the 15 parental lines differently. The SSR marker-based genetic distance was positively and highly significantly correlated with grain yield (r = 0.37), and negatively and highly significantly with days to anthesis (r = −0.40) and days to silking (r = −0.42). These relationships suggest that high grain yield and earliness of QPM hybrids can be predicted from SSR marker determined distances of the parents, although the correlation values were not very high. The correlations of SSR marker distance with heterosis were too low to be of predictive value except for the case of plant height. Morphological distances were of less importance in predicting hybrid performance and SCA effects of hybrids.